Replacement treadmill belts for sale in New Zealand. We have a wide variety of replacement treadmill belts in stock. I can supply and fit your treadmill belt. Or we can just send you a replacement treadmill belt to fit yourself. We import only high-quality treadmill belts. And because we sell our treadmill belts direct to you, we can keep our prices low. I used to get our belts made to order but the prices kept increasing. When the average treadmill belt price was over $240 I knew I needed to import my own belts. Our average treadmill belt price is $180. We have treadmill belts from $140 to $300 for home treadmills and we have commercial treadmill belts from $400. 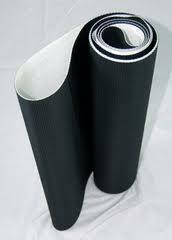 We hold our stock of treadmill belts in Auckland. So we can have a treadmill belt send to your door within days. You’ll need to know the make and model of your treadmill. We have listings for most treadmill belts. If we don’t have your treadmill listed you may have to measure your treadmill belt. Please note all our home treadmill belts need to be lubricated every 2-3 months depending on usage. And remember that if you haven’t used your treadmill in a while, you may need to lubricate your treadmill belt as the treadmill lubricant will evaporate over time.